I love bath bombs, I am always looking for new ones but they can be a little expensive especially because you can only usually get one use out of them, unlike bubble bars for example. 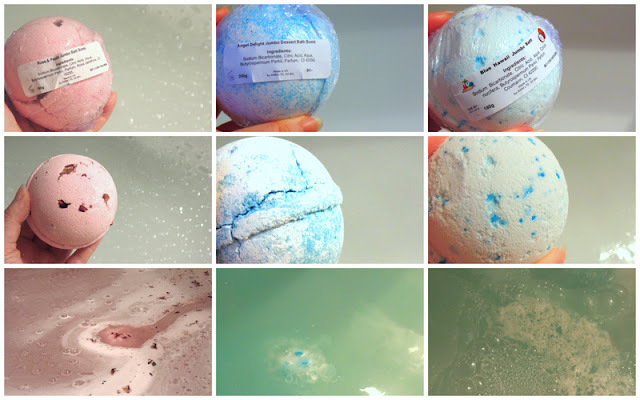 However when the super lovely people at The Bath Mama sent me some of their jumbo bath bombs, I was so excited to try them! I have the *Bath Mama Rose & Petals Jumbo bath Bomb (£1.99, 180g) which is rather massive! The scent of this one isn't as floral as I thought it would be but it still has floral notes and it is also very sweet, in my opinion. I love the colour and when placed in the water it is very pretty, it released cute petals as it fizzed away; also you get a lot of petals in the bath bomb, unlike ones from other brands. It fizzed for a while, much longer than the Angel Delight and Blue Hawaii bath bombs. As you can see from the photos and video, it leaves my bath looking so gorgeous with a small amount of bubbles as well as petals and pink water. I loved this one and it didn't irritate my eczema although it didn't scent my skin. It is one of the nicest and prettiest bath bombs I have used or a long time! Overall rating: ★★★★★, 5/5. Next up, the *Bath Mama Angel Delight Jumbo Bath Bomb (£1.99, 180g) which isn't a scent I would have picked for myself but it is surprisingly nice. The bath bomb doesn't look as cute or interesting as the previous one either in the packaging or in the water. However, it does smell very sweet and girly - the name is very accurate. The bath bomb fizzed away quite quickly and the scent wasn't as strong but it did soften the skin and it made the bath water look like a pale blue water-icing almost. Overall rating: ★★★☆☆, 3/5. Last but not least I have the *Bath Mama Blue Hawaii Jumbo Bath Bomb (£1.99, 180g) which again isn't a scent I would have picked but it does look quite tropical and summery; the scent is creamy and tropical. It smells mostly like creamy coconut to me with slight fruity notes. The scent isn't very strong in the water which would be great if you don't like heavily scented products. The bath bomb, as with the angel delight scent, isn't as exciting or pretty as the lovely roses and petals bath bomb *which I love*. The bath bomb didn't scent my skin but it didn't irritate my skin or strip it. Overall rating: ★★★☆☆, 3/5. Have you tried anything from Bath Mama? What is your favourite bath bomb brand? Oh these look absolutely beautiful!! I definitely need to try the rose petal one... I can't think of anything better than a pink bath with rose petals in it! I have never tried anything from bath mama but they look great! i usually buy lush bath bombs which are also very nice. These look like so much fun! I've been wanting to try LUSH bath bombs, but since these were half the price I may have to check them out! Great review! These bath bombs look lovely, I always think nothing can beat lush products but I think these could be a good contender. Great post and video! I have never ever tried a bath bomb, although they sound very nice! I just always prefer showers! Great review, I do love a good bath bomb! I love an affordable baths stuff company, the prices are so great! Just discovered your blog it's fab!